This interior suite is the site of Capital English Solutions, an English language school for high school and college level students of different backgrounds and first languages, from all around the world. 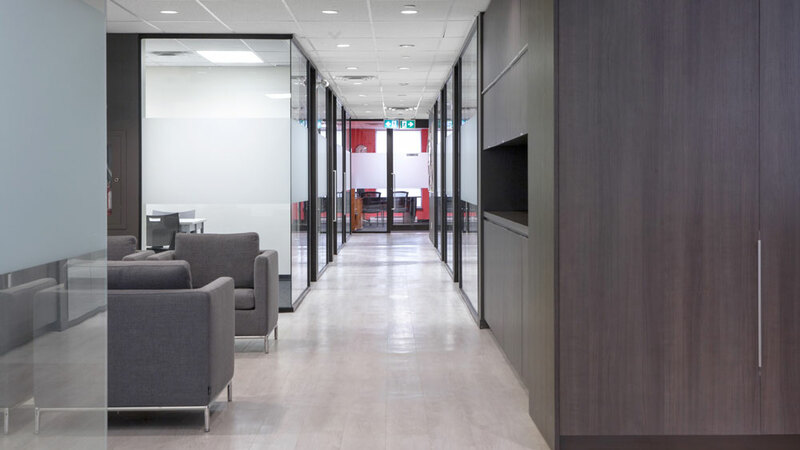 Located in the heart of downtown Toronto, this 12 000 sf floor plate fits several classrooms (both for lecture and seminar style learning), reception desks, offices, a library, common areas and a kitchen. The main concept of this space is efficiency of planning; maximizing sunlight and classroom space, while shaping the negative space of the corridor into useful communal areas. The student’s corridor encircles the floorplan, widening to accommodate seating areas, reception desks, and cafeteria seating. These spaces create the supportive environment where students can come together to learn and practice essential English communication skills. Another corridor runs down the centre of the plan, this hall remains narrow throughout, only servicing administrative offices. The reception desks are placed in an open and public area, opening up the line of communication between students and administrative staff. A challenge in the organization of this space was working with the pre-existing structure. As a mix of wood construction, and new steel construction, the column grid was not completely regular. To overcome this, the columns are finished in a light colour with soft corners, to downplay their visibility. The entire palate of the interior was bright and neutral, with red to represent the school’s brand. This allows the space to appear clean, light and expansive.